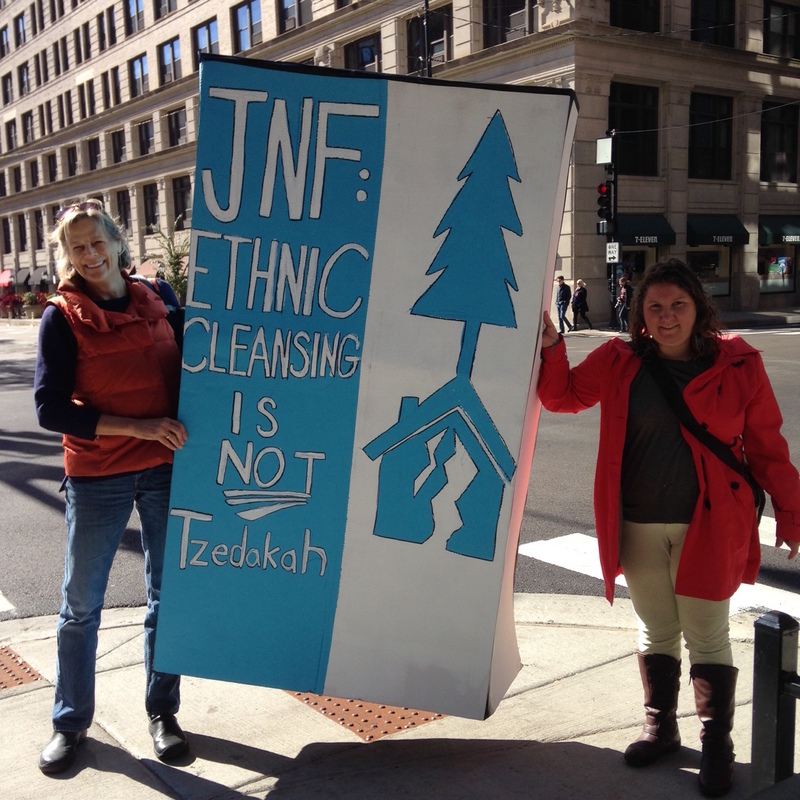 Last weekend, over 300 people gathered together in Chicago to protest the Jewish National Fund’s (JNF) Annual Conference. Over the course of two days, we prayed, chanted, marched, and even danced to expose the Jewish National Fund’s involvement in the mass displacement of Palestinians and call on American Jewish communities to stop supporting the JNF’s ongoing ethnic cleansing. 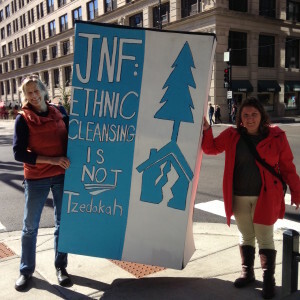 Most of us in JVP-Chicago are new to the campaign against the JNF. Yet the JNF’s 100+ year effort to expel Palestinians from their homes – and cover the traces of their existence with Jewish-only houses, parks, and pine forests – is at the heart of Israel’s brutal military occupation. An occupation against which Palestinians have once again risen up in protest. 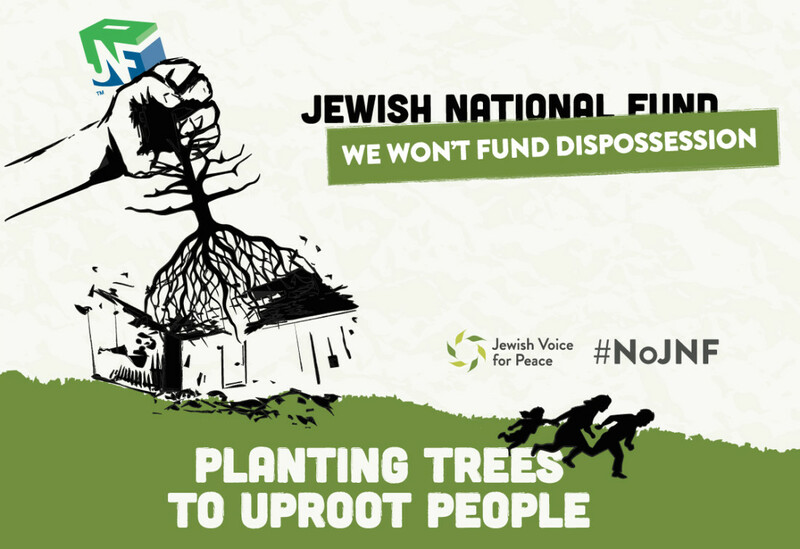 The imperative to speak out against the JNF was made all the more clear to us in the month leading up to the actions as violence in Israel-Palestine escalated – a violence that ultimately stems from decades of oppression, dispossession, and discrimination promoted by the JNF. 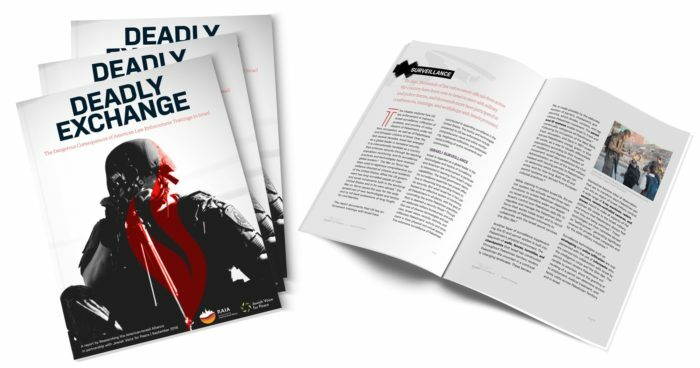 The most recent wave of attacks was an important reminder that for Palestinians, their struggle is not only a moral question of following their consciences or practicing their values- it is a fight for their lives. 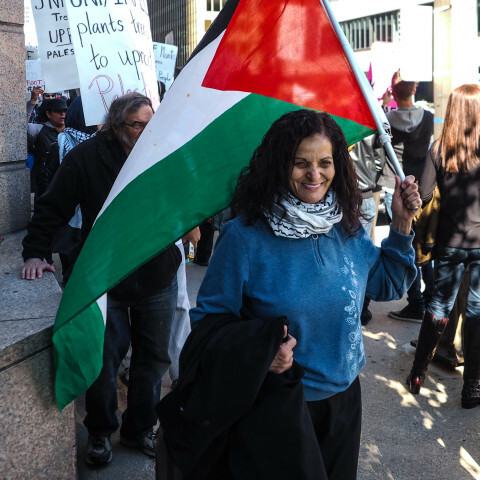 From Rasmea Odeh in Chicago to Hadeel Salah al-Hashlamon in Al-Khalil, Palestinian’s right to existence has been denied every day by both the United States and by Israel. The accelerated collective punishment inflicted on them underscored for us even more the need to take collective action against institutions like the JNF that are among the root causes of today’s violence. As we stood together with members of the Palestinian-led Chicago Coalition for Justice in Palestine, Tzedek Chicago, and other supporters, I began to see just how powerful that action could be. 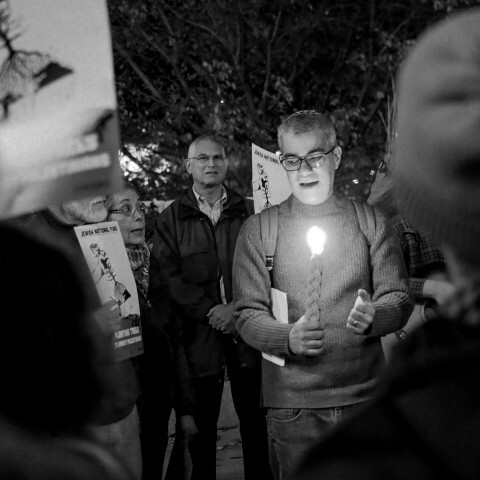 From our vigil and Havdallah service outside of the JNF’s major donor dessert reception on Saturday night through the rally and march at the conference hotel itself the next day, we found proof of our ability to disrupt the JNF agenda of “greenwashing” Israel’s occupation. The actions throughout the weekend were a reminder for me of what it means to use my privilege as an American Jew, and as a white American Jew, to creatively intervene in the JNF machine (which runs through American Jewish support) and disrupt business as usual. JVP-Chicago and other participants have just begun to unpack lessons learned from the two actions. The weekend provided us with many examples of how much more powerful, creative, and effective we are when we work together -with each other, with JVP members from across the country, with organizers from other causes and communities, and most importantly with our Palestinian coalition partners. It showed many of us how much more we need to do to engage other Jews and truly work in solidarity with Palestinians and people of color organizing for justice both in Israel-Palestine and here in Chicago. After last weekend’s actions I am even more grateful that this is a group with whom I get to struggle, mess up, learn, and ultimately make change.